In superconducting materials, electrons pair up and condense into a quantum state that carries electrical current with no loss. This usually happens at very low temperatures. Scientists have mounted an all-out effort to develop new types of superconductors that work at close to room temperature, which would save huge amounts of energy and open a new route for designing quantum electronics. To get there, they need to figure out what triggers this high-temperature form of superconductivity and how to make it happen on demand. Now, in independent studies reported in Science and Nature, scientists from the Department of Energy’s SLAC National Accelerator Laboratory and Stanford University report two important advances: They measured collective vibrations of electrons for the first time and showed how collective interactions of the electrons with other factors appear to boost superconductivity. Carried out with different copper-based materials and with different cutting-edge techniques, the experiments lay out new approaches for investigating how unconventional superconductors operate. 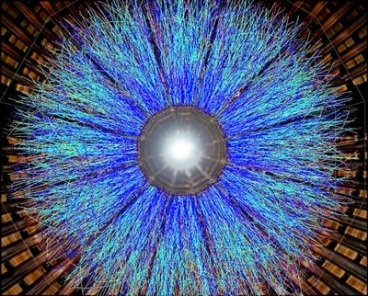 “Basically, what we’re trying to do is understand what makes a good superconductor,” said co-author Thomas Devereaux, a professor at SLAC and Stanford and director of SIMES, the Stanford Institute for Materials and Energy Sciences, whose investigators led both studies. Conventional superconductors were discovered in 1911, and scientists know how they work: Free-floating electrons are attracted to a material’s lattice of atoms, which has a positive charge, in a way that lets them pair up and flow as electric current with 100 percent efficiency. Today, superconducting technology is used in MRI machines, maglev trains and particle accelerators. But these superconductors work only when chilled to temperatures as cold as outer space. So when scientists discovered in 1986 that a family of copper-based materials known as cuprates can superconduct at much higher, although still quite chilly, temperatures, they were elated. The operating temperature of cuprates has been inching up ever since – the current record is about 120 degrees Celsius below the freezing point of water – as scientists explore a number of factors that could either boost or interfere with their superconductivity. But there’s still no consensus about how the cuprates function. “The key question is how can we make all these electrons, which very much behave as individuals and do not want to cooperate with others, condense into a collective state where all the parties participate and give rise to this remarkable collective behavior?” said Zhi-Xun Shen, a SLAC/Stanford professor and SIMES investigator who participated in both studies. 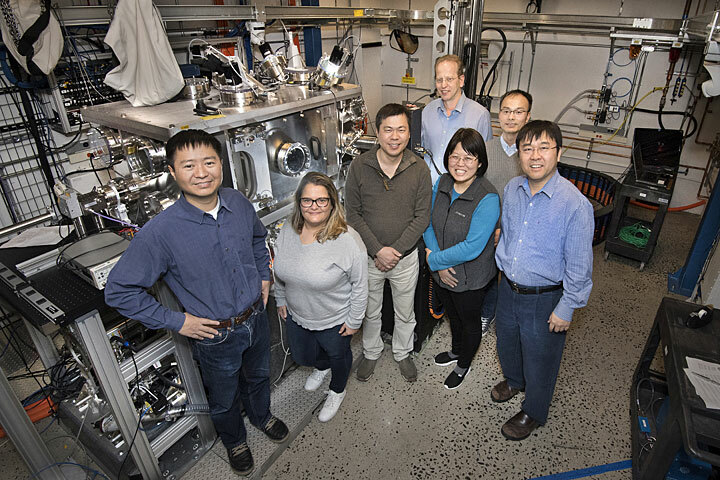 One of the new studies, at SLAC’s Stanford Synchrotron Radiation Lightsource (SSRL), took a systematic look at how “doping” – adding a chemical that changes the density of electrons in a material – affects the superconductivity and other properties of a cuprate called Bi2212. Collaborating researchers at the National Institute of Advanced Industrial Science and Technology (AIST) in Japan prepared samples of the material with slightly different levels of doping. 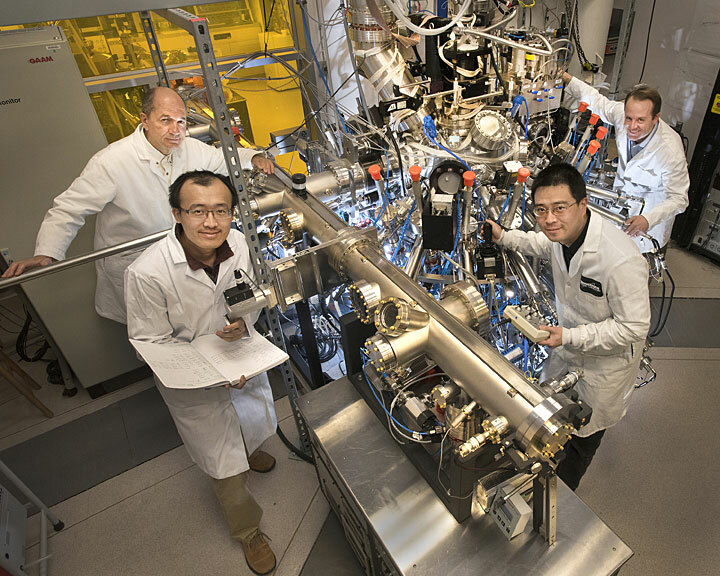 Then a team led by SIMES researcher Yu He and SSRL staff scientist Makoto Hashimoto examined the samples at SSRL with angle-resolved photoemission spectroscopy, or ARPES. It uses a powerful beam of X-ray light to kick individual electrons out of a sample material so their momentum and energy can be measured. This reveals what the electrons in the material are doing. In this case, as the level of doping increased, the maximum superconducting temperature of the material peaked and fell off again, He said. The team focused in on samples with particularly robust superconducting properties. They discovered that three interwoven effects – interactions of electrons with each other, with lattice vibrations and with superconductivity itself – reinforce each other in a positive feedback loop when conditions are right, boosting superconductivity and raising the superconducting temperature of the material. Small changes in doping produced big changes in superconductivity and in the electrons’ interaction with lattice vibrations, Devereaux said. The next step is to figure out why this particular level of doping is so important. 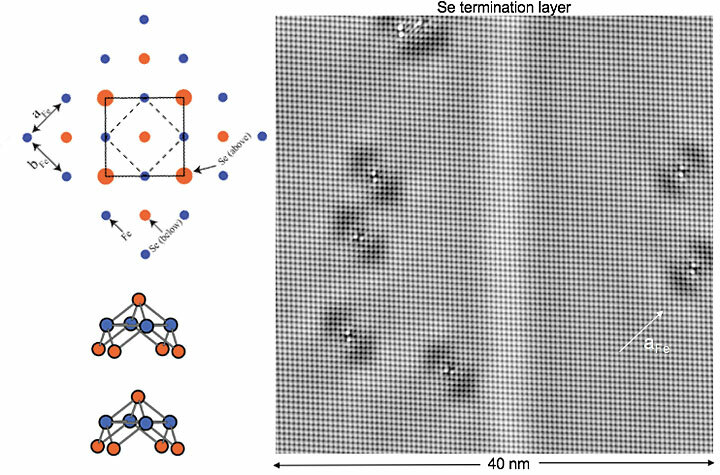 In this study, He said, “What we find is that the lattice has a behind-the-scenes role after all, and we may have overlooked an important ingredient for high-temperature superconductivity for the past three decades,” a conclusion that ties into the results of earlier research by the SIMES group Science. The other study, performed at the European Synchrotron Radiation Facility (ESRF) in France, used a technique called resonant inelastic X-ray scattering, or RIXS, to observe the collective behavior of electrons in layered cuprates known as LCCO and NCCO. RIXS excites electrons deep inside atoms with X-rays, and then measures the light they give off as they settle back down into their original spots. In the past, most studies have focused only on the behavior of electrons within a single layer of cuprate material, where electrons are known to be much more mobile than they are between layers, said SIMES staff scientist Wei-Sheng Lee. He led the study with Matthias Hepting, who is now at the Max Planck Institute for Solid State Research in Germany. 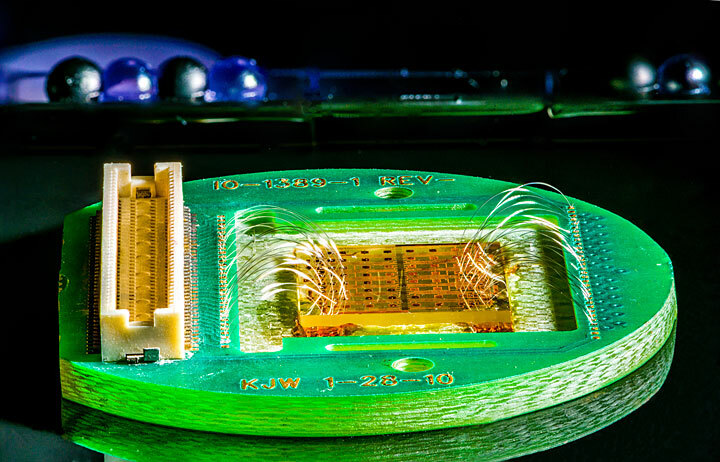 But in this case, the team wanted to test an idea raised by theorists – that the energy generated by electrons in one layer repelling electrons in the next one plays a critical role in forming the superconducting state. When excited by light, this repulsion energy leads electrons to form a distinctive sound wave known as an acoustic plasmon, which theorists predict could account for as much as 20 percent of the increase in superconducting temperature seen in cuprates. With the latest in RIXS technology, the SIMES team was able to observe and measure those acoustic plasmons. This observation sets the stage for future studies that manipulate the sound waves with light, for instance, in a way that enhances superconductivity, Lee said. The results are also relevant for developing future plasmonic technology, he said, with a range of applications from sensors to photonic and electronic devices for communications. SSRL is a DOE Office of Science user facility, and SIMES is a joint institute of SLAC and Stanford. In addition to researchers from SLAC, Stanford and AIST, the study carried out at SSRL involved scientists from University of Tokyo; University of California, Berkeley; and Lorentz Institute for Theoretical Physics in the Netherlands. The study conducted at ESRF also involved researchers from SSRL; Polytechnic University of Milan in Italy; ESRF; Binghamton University in New York; and the University of Maryland. Both studies were funded by the DOE Office of Science. In Paolo Ermanni’s laboratory at the ETH in Zürich, the composite materials of the future are developed. 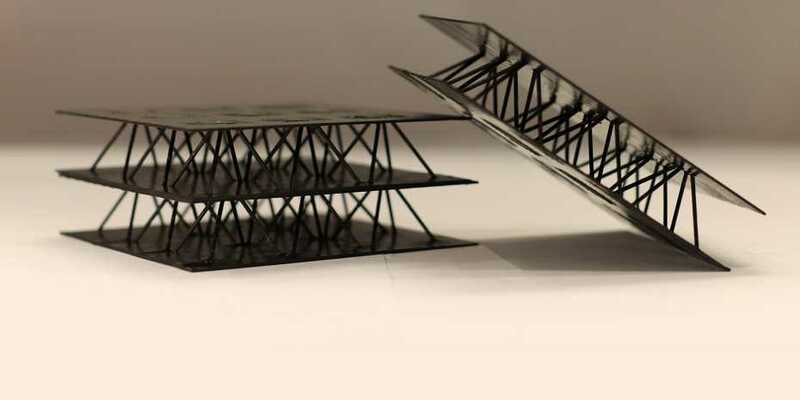 By optimizing the core elements of sandwich structures, the researchers create materials that are extremely light, robust and adaptable at once – and thus ideal for aerospace applications. Materials that are light and robust, inherently stable and still easily adjustable, and which can also be produced sustainably and in a resource-friendly way – what may appear as impossible as squaring the circle becomes a reality day after day in Paolo Ermanni’s lab at the ETH in Zürich. “It is our philosophy to develop modern composite materials for adaptive systems and, while doing so, to optimize their structural efficiency – that is, obtaining the same performance with fewer resources or better functionality with the same amount of material”, says Paolo Ermanni, professor for Composite Materials and Adaptive Structures at ETH. At the same time, he and his collaborators investigate appropriate production processes that make the new materials interesting for practical applications. Ermanni’s PhD student Christoph Karl takes care of the “structural efficiency” aspect. “As they feature a large stiffness and stability whilst also being very light, sandwich structures are often used for lightweight construction”, he explains. Sandwich structures typically consist of two thin and stiff cover layers and a low-density core material. “In our research we develop high-performance sandwich composites made of carbon fibre-reinforced polymers, also known as CRP’s or simply carbon fibre. In this approach, the core consists of a truss structure of carbon fibre rods”, says Karl. The good mechanical properties of carbon fibre mean that such core structures can have a larger stiffness and stability than conventional foam or honeycomb cores. The core of a sandwich material constructed and optimized in this way weighs less than 30 kilograms per cubic metre (a cubic metre of steel, for comparison, weighs in at almost 8000 kilograms). “This makes ours materials particularly interesting for aerospace application, where structural efficiency is of crucial importance,” says Karl. “Moreover, it is possible to integrate additional features, such as vibration damping, directly into the core structure.” In the framework of the EU project ALTAIR led by the French aerospace lab Onera, real-life applications of the new sandwich structures are investigated. Within that project, Ermanni’s research group is involved in the development of load-bearing structures of new deployment systems for small satellites. Flexible and adaptive structures, on the other hand, are the specialty of PhD student Oleg Testoni. Within the Strategic Focus Area “Advanced Manufacturing” of the ETH board, he develops techniques that allow one to adapt sandwich structures flexibly and dynamically. Those techniques could be used, for instance, to build futuristic spoilers or wheelhouses for sports cars that can be deformed while the vehicle is in motion in order to accurately optimize its aerodynamics for a particular velocity or wheel position when cornering. To achieve such a degree of flexibility whilst maintaining the robustness of the material, semi-active elements – so-called mechanical switches – are embedded in the material. “With such switches, the rods inside the core can be temporarily loosened in order to adapt the shape. After that, they are locked in place again so that the material regains its original stiffness”, Testoni explains. Mechanical switches can be built using “intelligent materials” such as shape memory alloys. A component made of such an alloy can take on two different shapes depending on temperature. Above a certain critical temperature, its shape changes, but when cooled down it goes back to its exact original shape. By fitting many of those mechanical switches inside the rods of a sandwich structure, one can change the shape of the entire material. Ermanni and his co-workers do not just carry out basic research on new materials, however. The spin-off company 9T Labs, co-founded by Ermanni’s PhD student Martin Eichenhofer, develops a 3D-printing technology that can be used to produce high-quality carbon fibre components such as the rods for sandwich structure cores in a robust and flexible manner. “First and foremost, this is about expanding the range of application of such materials through novel production techniques, which will enable smaller companies to use them as well. This ‹democratizes› lightweight construction technologies, as it were,” says Eichenhofer. The first products for 3D-printing are supposed to hit the market as early as 2019. “This procedure also opens up the possibility of integrating active elements directly into the printing process in the future, thus realizing 4D-printing,” Ermanni adds. ETH Zürich is one of the leading international universities for technology and the natural sciences. It is well known for its excellent education, ground-breaking fundamental research and for implementing its results directly into practice. Founded in 1855, ETH Zürich today has more than 18,500 students from over 110 countries, including 4,000 doctoral students. To researchers, it offers an inspiring working environment, to students, a comprehensive education. Twenty-one Nobel Laureates have studied, taught or conducted research at ETH Zürich, underlining the excellent reputation of the university. On Monday, September 24, the U.S. Department of Energy announced $218 million in funding for dozens of research awards in the field of Quantum Information Science. Nearly $2 million was awarded to DOE’s Pacific Northwest National Laboratory for a new quantum computing chemistry project. 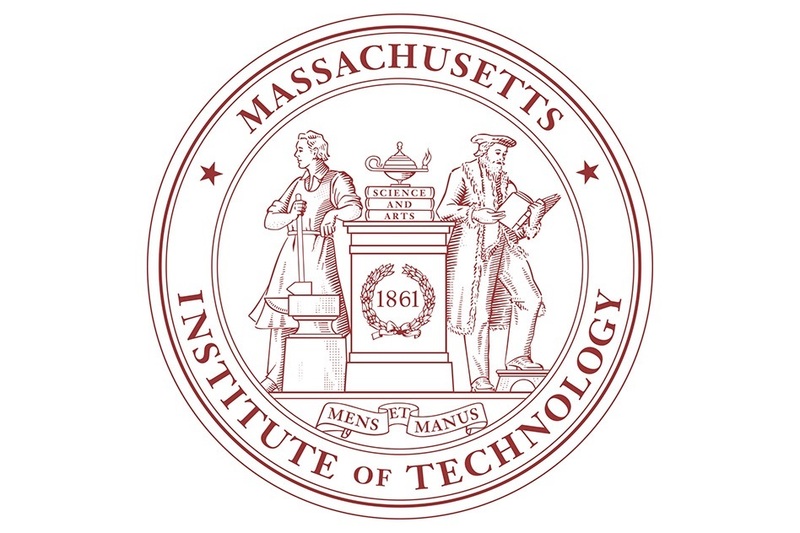 Kowalski’s proposal was chosen along with 84 others to further the nation’s research in QIS and lay the foundation for the next generation of computing and information processing as well as an array of other innovative technologies. While Kowalski’s work will take place over the next three years, computational chemists everywhere will experience a more immediate upgrade to their capabilities in computational chemistry made possible by a new PNNL-Microsoft partnership. 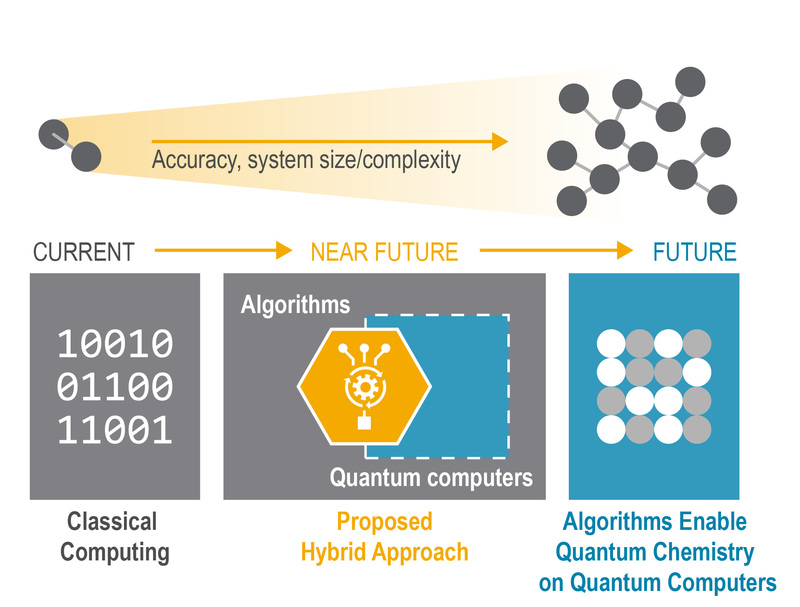 “We are working with Microsoft to combine their quantum computing software stack with our expertise on high-performance computing approaches to quantum chemistry,” said Sriram Krishnamoorthy who leads PNNL’s side of this collaboration. Microsoft will soon release an update to the Microsoft Quantum Development Kit which will include a new chemical simulation library developed in collaboration with PNNL. The library is used in conjunction with NWChem, an open source, high-performance computational chemistry tool funded by DOE. Together, the chemistry library and NWChem will help enable quantum solutions and allow researchers and developers a higher level of study and discovery. “Researchers everywhere will be able to tackle chemistry challenges with an accuracy and at a scale we haven’t experienced before,” said Nathan Baker, director of PNNL’s Advanced Computing, Mathematics, and Data Division. 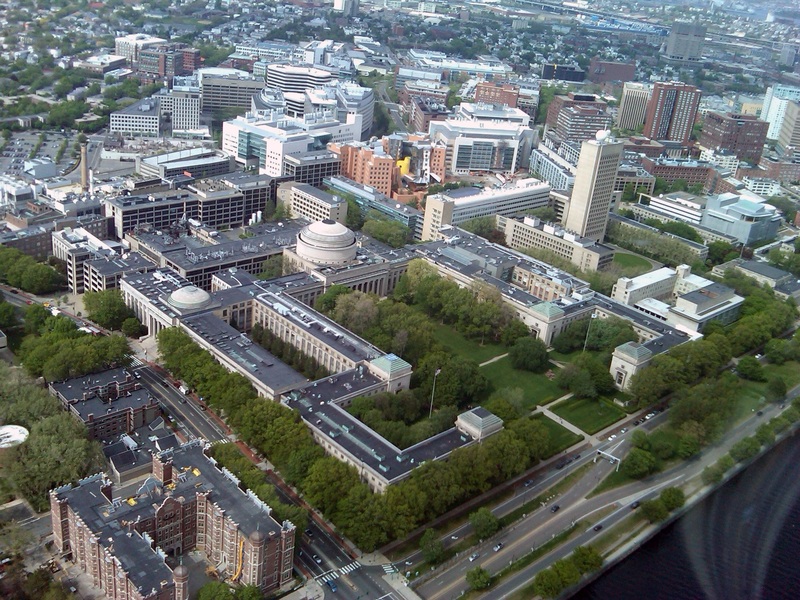 Wendy Shaw, the lab’s division director for physical sciences, agrees with Baker. “Development and applications of quantum computing to catalysis problems has the ability to revolutionize our ability to predict robust catalysts that mimic features of naturally occurring, high-performing catalysts, like nitrogenase,” said Shaw about the application of QIS to her team’s work. PNNL’s aggressive focus on quantum information science is driven by a research interest in the capability and by national priorities. In September, the White House published the National Strategic Overview for Quantum Information Science and hosted a summit on the topic. Through their efforts, researchers hope to unleash quantum’s unprecedented processing power and challenge traditional limits for scaling and performance. In addition to the new DOE funding, PNNL is also pushing work in quantum conversion through internal investments. Researchers are determining which software architectures allow for efficient use of QIS platforms, designing QIS systems for specific technologies, imagining what scientific problems can best be solved using QIS systems, and identifying materials and properties to build quantum systems. The effort is cross-disciplinary; PNNL scientists from its computing, chemistry, physics, and applied mathematics domains are all collaborating on quantum research and pushing to apply their discoveries. “The idea for this internal investment is that PNNL scientists will take that knowledge to build capabilities impacting catalysis, computational chemistry, materials science, and many other areas,” said Krishnamoorthy. Krishnamoorthy wants QIS to be among the priorities that researchers think about applying to all of PNNL’s mission areas. With continued investment from the DOE and partnerships with industry leaders like Microsoft, that just might happen. A SLAC-Stanford study reveals exactly what it takes for diamond to crystallize around a “seed” cluster of atoms. The results apply to industrial processes and to what happens in clouds overhead. Natural diamond is forged by tremendous pressures and temperatures deep underground. But synthetic diamond can be grown by nucleation, where tiny bits of diamond “seed” the growth of bigger diamond crystals. The same thing happens in clouds, where particles seed the growth of ice crystals that then melt into raindrops. Scientists have now observed for the first time how diamonds grow from seed at an atomic level, and discovered just how big the seeds need to be to kick the crystal growing process into overdrive. The results, published this week in Proceedings of the National Academy of Sciences, shed light on how nucleation proceeds not just in diamonds, but in the atmosphere, in silicon crystals used for computer chips and even in proteins that clump together in neurological diseases. In fact, scientists have known for a long time that the current theory often overestimates how much energy it takes to kick off the nucleation process, and by quite a bit. They’ve come up with potential ways to reconcile the theory with reality, but until now those ideas have been tested only at a relatively large scale, for instance with protein molecules, rather than at the atomic scale where nucleation begins. To see how it works at the smallest scale, Melosh and his team turned to diamondoids, the tiniest possible bits of diamond. The smallest ones contain just 10 carbon atoms. These specks are the focus of a DOE-funded program at SLAC and Stanford where naturally occurring diamondoids are isolated from petroleum fluids, sorted by size and shape and studied. Recent experiments suggest they could be used as Lego-like blocks for assembling nanowires or “molecular anvils” for triggering chemical reactions, among other things. The latest round of experiments was led by Stanford postdoctoral researcher Matthew Gebbie. He’s interested in the chemistry of interfaces – places where one phase of matter encounters another, for instance the boundary between air and water. It turns out that interfaces are incredibly important in growing diamonds with a process called CVD, or chemical vapor deposition, that’s widely used to make synthetic diamond for industry and jewelry. To grow diamond in the lab with CVD, tiny bits of crushed diamond are seeded onto a surface and exposed to a plasma – a cloud of gas heated to such high temperatures that electrons are stripped away from their atoms. The plasma contains hydrogen and carbon, the two elements needed to form a diamond. This plasma can either dissolve the seeds or make them grow, Gebbie says, and the competition between the two determines whether bigger crystals form. Since there are many ways to pack carbon atoms into a solid, it all has to be done under just the right conditions; otherwise you can end up with graphite, commonly known as pencil lead, instead of the sparkly stuff you were after. Diamondoid seeds give scientists a much finer level of control over this process. Although they’re too small to see directly, even with the most powerful microscopes, they can be precisely sorted according to the number of carbon atoms they contain and then chemically attached to the surface of a silicon wafer so they’re pinned in place while being exposed to plasma. The crystals that grow around the seeds eventually get big enough to count under a microscope, and that’s what the researchers did. Although diamondoids had been used to seed the growth of diamonds before, these were the first experiments to test the effects of using seeds of various sizes. The team discovered that crystal growth really took off with seeds that contain at least 26 carbon atoms. Even more important, Gebbie says, they were able to directly measure the energy barrier that diamondoid particles have to overcome in order to grow into crystals. This research took place at SIMES, the Stanford Institute for Materials and Energy Sciences, with major funding from the DOE Office of Science. In addition to SLAC and Stanford, researchers contributing to this study came from the Institute of Physics of the Czech Academy of Sciences, University Hasselt in Belgium and the Institute of Organic Chemistry at Justus-Liebig University in Germany. By observing changes in materials as they’re being synthesized, scientists hope to learn how they form and come up with recipes for making the materials they need for next-gen energy technologies. Over the last decade, scientists have used supercomputers and advanced simulation software to predict hundreds of new materials with exciting properties for next-generation energy technologies. Now they need to figure out how to make them. To predict the best recipe for making a material, they first need a better understanding of how it forms, including all the intermediate phases it goes through along the way – some of which may be useful in their own right. Now experiments at the Department of Energy’s SLAC National Accelerator Laboratory have confirmed the predictive power of a new computational approach to materials synthesis. Researchers say that this approach, developed at the DOE’s Lawrence Berkeley National Laboratory, could streamline the creation of novel materials for solar cells, batteries and other sustainable technologies. This team described their findings June 29 in Nature Communications. These intermediate materials are said to exist in a state of metastability. 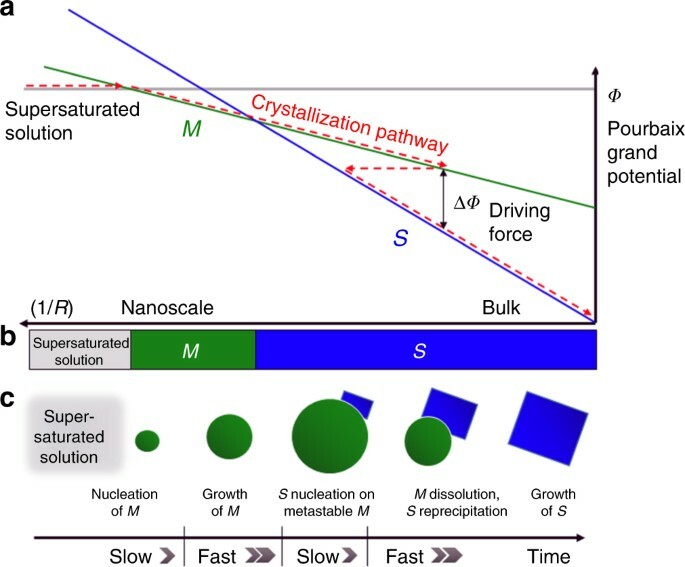 During synthesis, materials can crystallize into a series of metastable phases – some lasting only a few minutes, others persisting for hours. Some of these phases have properties that are potentially useful for technological applications. Others may block the formation of a material you want to make. Scientists want to isolate the useful phases and avoid creating the undesirable ones. Co-authors Wenhao Sun and Gerbrand Ceder at Berkeley Lab and Daniil Kitchaev of the Massachusetts Institute of Technology recently developed a theoretical model to predict which metastable phases a material will form during synthesis. 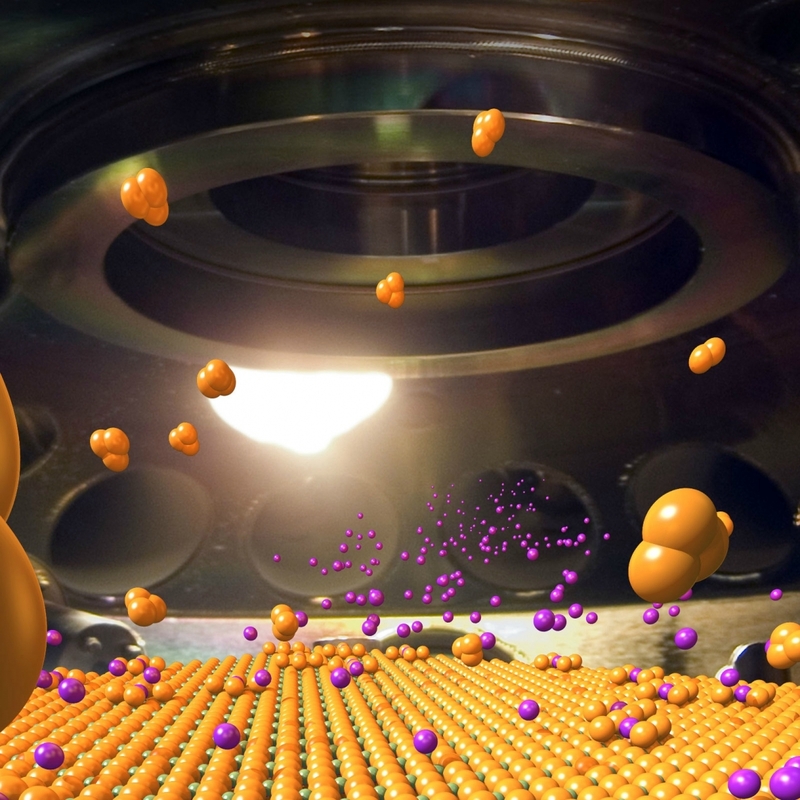 The experiment, conducted at SLAC’s Stanford Synchrotron Radiation Lightsource (SSRL), focused on manganese oxide, a compound whose formation can involve a variety of metastable crystalline structures. Some of these metastable structures are useful for battery applications or catalysis. Sun and Schelhas designed an experiment to carefully manipulate a single ingredient in a recipe for making manganese oxide and track its effect on the formation of metastable crystals. SLAC scientists led by postdoctoral researcher Bor-Rong Chen used powerful X-ray beams at SSRL to observe the chemical reaction as it happened. At first, the metastable phases identified by X-ray diffraction didn’t seem to match the theoretical predictions, Chen said. To continue developing their understanding of synthesis, the researchers plan to conduct experiments on more complicated materials. The team also found that they could stop the reaction at the point where a metastable material has formed, which will make it possible to test those materials for desirable properties in future studies, Schelhas said. Other co-authors of the study are from the Colorado School of Mines and the DOE’s National Renewable Energy Laboratory. 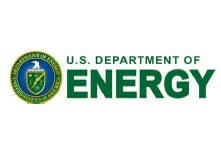 SSRL is a DOE Office of Science user facility. Funding for this work came from the Center for Next Generation of Materials Design, an Energy Frontier Research Center led by DOE’s National Renewable Energy Laboratory and funded by the DOE Office of Science. This scanning electron microscope image shows ultrafine diamond needles (cone shapes rising from bottom) being pushed on by a diamond tip (dark shape at top). These images reveal that the diamond needles can bend as much as 9 percent and still return to their original shape. Courtesy of the researchers. Diamond is well-known as the strongest of all natural materials, and with that strength comes another tightly linked property: brittleness. But now, an international team of researchers from MIT, Hong Kong, Singapore, and Korea has found that when grown in extremely tiny, needle-like shapes, diamond can bend and stretch, much like rubber, and snap back to its original shape. The surprising finding is being reported this week in the journal Science, in a paper by senior author Ming Dao, a principal research scientist in MIT’s Department of Materials Science and Engineering; MIT postdoc Daniel Bernoulli; senior author Subra Suresh, former MIT dean of engineering and now president of Singapore’s Nanyang Technological University; graduate students Amit Banerjee and Hongti Zhang at City University of Hong Kong; and seven others from CUHK and institutions in Ulsan, South Korea. Experiment (left) and simulation (right) of a diamond nanoneedle being bent by the side surface of a diamond tip, showing ultralarge and reversible elastic deformation. No image credit. The results, the researchers say, could open the door to a variety of diamond-based devices for applications such as sensing, data storage, actuation, biocompatible in vivo imaging, optoelectronics, and drug delivery. For example, diamond has been explored as a possible biocompatible carrier for delivering drugs into cancer cells. The team showed that the narrow diamond needles, similar in shape to the rubber tips on the end of some toothbrushes but just a few hundred nanometers (billionths of a meter) across, could flex and stretch by as much as 9 percent without breaking, then return to their original configuration, Dao says. Ordinary diamond in bulk form, Bernoulli says, has a limit of well below 1 percent stretch. “It was very surprising to see the amount of elastic deformation the nanoscale diamond could sustain,” he says. “We developed a unique nanomechanical approach to precisely control and quantify the ultralarge elastic strain distributed in the nanodiamond samples,” says Yang Lu, senior co-author and associate professor of mechanical and biomedical engineering at CUHK. Putting crystalline materials such as diamond under ultralarge elastic strains, as happens when these pieces flex, can change their mechanical properties as well as thermal, optical, magnetic, electrical, electronic, and chemical reaction properties in significant ways, and could be used to design materials for specific applications through “elastic strain engineering,” the team says. The team measured the bending of the diamond needles, which were grown through a chemical vapor deposition process and then etched to their final shape, by observing them in a scanning electron microscope while pressing down on the needles with a standard nanoindenter diamond tip (essentially the corner of a cube). Following the experimental tests using this system, the team did many detailed simulations to interpret the results and was able to determine precisely how much stress and strain the diamond needles could accommodate without breaking. The researchers also developed a computer model of the nonlinear elastic deformation for the actual geometry of the diamond needle, and found that the maximum tensile strain of the nanoscale diamond was as high as 9 percent. The computer model also predicted that the corresponding maximum local stress was close to the known ideal tensile strength of diamond — i.e. the theoretical limit achievable by defect-free diamond. When the entire diamond needle was made of one crystal, failure occurred at a tensile strain as high as 9 percent. Until this critical level was reached, the deformation could be completely reversed if the probe was retracted from the needle and the specimen was unloaded. If the tiny needle was made of many grains of diamond, the team showed that they could still achieve unusually large strains. However, the maximum strain achieved by the polycrystalline diamond needle was less than one-half that of the single crystalline diamond needle. Yonggang Huang, a professor of civil and environmental engineering and mechanical engineering at Northwestern University, who was not involved in this research, agrees with the researchers’ assessment of the potential impact of this work. “The surprise finding of ultralarge elastic deformation in a hard and brittle material — diamond — opens up unprecedented possibilities for tuning its optical, optomechanical, magnetic, phononic, and catalytic properties through elastic strain engineering,” he says. The team also included Muk-Fung Yuen, Jiabin Liu, Jian Lu, Wenjun Zhang, and Yang Lu at the City University of Hong Kong; and Jichen Dong and Feng Ding at the Institute for Basic Science, in South Korea. The work was funded by the Research Grants Council of the Hong Kong Special Administrative Region, Singapore-MIT Alliance for Rresearch and Technology (SMART), Nanyang Technological University Singapore, and the National Natural Science Foundation of China. 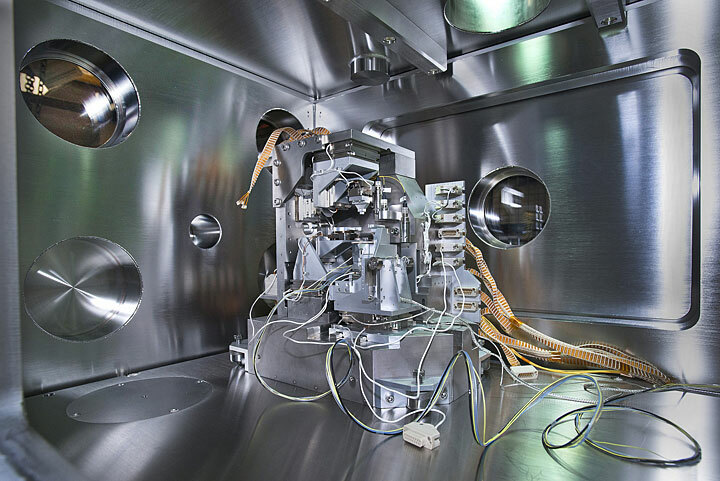 The Hard X-ray Nanoprobe at Brookhaven Lab’s National Synchrotron Light Source II now offers a combination of world-leading spatial resolution and multimodal imaging. Scientists at NSLS-II’s Hard X-ray Nanoprobe (HXN) spent 10 years developing advanced optics and overcoming many technical challenges in order to deliver world-leading spatial resolution and multimodal imaging at HXN. By channeling the intensity of x-rays, synchrotron light sources can reveal the atomic structures of countless materials. Researchers from around the world come to the National Synchrotron Light Source II (NSLS-II)—a U.S. Department of Energy (DOE) Office of Science User Facility at DOE’s Brookhaven National Laboratory—to study everything from proteins to fuel cells. NSLS-II’s ultra-bright x-rays and suite of state-of-the-art characterization tools make the facility one of the most advanced synchrotron light sources in the world. Now, NSLS-II has enhanced those capabilities even further. Scientists at NSLS-II’s Hard X-ray Nanoprobe (HXN) beamline, an experimental station designed to offer world-leading resolution for x-ray imaging, have demonstrated the beamline’s ability to observe materials down to 10 nanometers—about one ten-thousandth the diameter of a human hair. This exceptionally high spatial resolution will enable scientists to “see” single molecules. Moreover, HXN can now combine its high spatial resolution with multimodal scanning—the ability to simultaneously capture multiple images of different material properties. The achievement is described in the Mar. 19 issue of Nano Futures. A key component for the success of this project was developing a special focusing optic called a multilayer Laue lens (MLL)—a one-dimensional artificial crystal that is engineered to bend x-rays toward a single point. A close-up view of the Hard X-ray Nanoprobe—beamline 3-ID at NSLS-II. 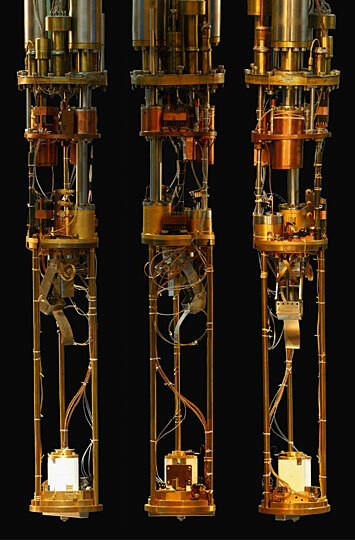 Combining multimodal and high resolution imaging is unique, and makes NSLS-II the first facility to offer this capability in the hard x-ray energy range to visiting scientists. The achievement will present a broad range of applications. In their recent paper, scientists at NSLS-II worked with the University of Connecticut and Clemson University to study a ceramic-based membrane for energy conversion application. Using the new capabilities at HXN, the group was able to image an emerging material phase that dictates the membrane’s performance. As the new capabilities are put to use, there is an ongoing effort at HXN to continue improving the beamline’s spatial resolution and adding new capabilities. “Our ultimate goal is to achieve single digit resolution in 3D for imaging the elemental, chemical, and structural makeup of materials in real-time,” Yan said.